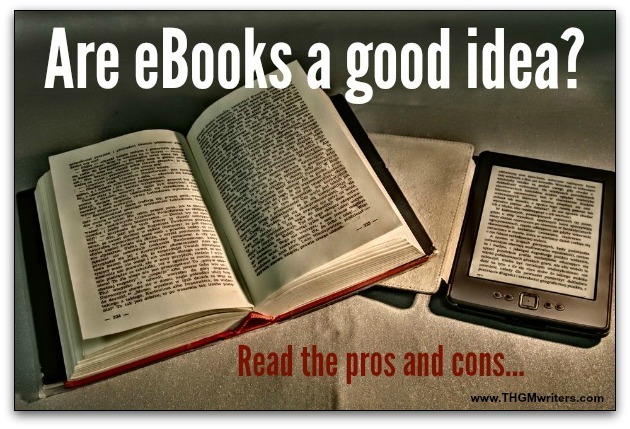 There are pros and cons of eBooks replacing paper books. Before I list a few, let me say that I still love paper. I spend so much time staring at a screen for work, that I really don’t want to stare at a screen when I don’t have to. But there are some undeniable advantages to eBooks. eBooks don’t end up as landfill waste. Trees are the lungs of the earth, so saving them is a good thing. It takes more energy to manufacture and ship a paper book than to download an eBook. eBooks are searchable. One of my pet peeves in books and in long magazine articles is when, part-way through, a name is mentioned as if I should know who the person is. Typically, that person was mentioned earlier, but my memory failed. eBooks to the rescue! If you don’t remember who that person is because you read the first chapter three weeks ago, just search for the name to refresh your memory. eBooks are portable. I think this is one of the advantages people like most. You can carry several books with you, without having to make an effort, without even having to think about it. They are there with you on your device. An entire library at your fingertips! Although many novels are fairly portable, even in paper, there are some books that you just would not drag around with you. This is especially true for reference books, but also for some very large novels. You can read eBooks in the dark. For some people, this is a huge advantage. You can read them in bed without waking up your spouse, or without having to get up to turn off the light. If you have young kids trying to nap, you can sit with them in the dark and read. No more flashlight under the blanket. You can change font size. This might not be the biggest advantage to eBooks, but if you have weak eyes or if you are tired, it’s nice to be able to increase the size of the text. In some cases, you can annotate eBooks . This is another advantage with limited appeal. Nevertheless, it is an advantage for some people. With paper books, annotations require having a pen or highlighter handy, and the annotation can’t be undone. With paper, you have to bend a corner to mark a page. You can follow links. When an author includes links in an eBook, you have the whole world at your fingertips. It’s nice to be able to easily seek clarifications or further details. Instant download. When you need a new book, you just get one. You can do it in the bath or in your pyjamas. No need to get dressed and drive to a store. eBooks cost less. Without manufacturing and shipping, the environment is not the only green you save. eBooks are the frugal way to be a bookworm. eBooks are the frugal way to be a bookworm. Video and audio. One big advantage that has yet to really take hold is embedding audio and video. Multimedia books could just be the wave of the future, and audio books are wonderful options for people who spend a lot of time on the road. “Read” a couple chapters while driving to your destination, then read the next chapter the conventional way while waiting for your appointment. Why is this feature not yet mainstream? You have to stare at a screen. For those of who stare at a screen all day for work, this is a huge disadvantage. Eye strain, from staring at screens too long, has become quite a health problem. Some people don’t mind, but I do. If you enjoy reading before bed, taking advantage of reading in the dark, you might also get screen insomnia. This is a growing problem that cancels out a benefit of eBooks. You don’t get “book satisfaction”. There is something I like about turning pages. It’s how I grew up. In a few years, this will disappear as a disadvantage, as more and more people grow up with eBooks. But I’ll remain a luddite in this respect. You can lose your files. If you forget to back up your files and you lose or delete by accident. This is a pretty weak disadvantage, because you can always get a new copy. Besides, you can also lose paper books. eBooks are harder to read in sunlight. The glare of the sun makes a screen hard to read. Paper is still better at the beach. You need a device. This is a disadvantage for at least 15% of people. That’s how many Americans don’t own devices. That figure is similar or higher in most developed countries. Paper books don’t run out of batteries. You need batteries. Even if you have a device, you have it only when the batteries are charged. And I’ve seen people run out of batteries often enough. Paper books don’t run out of batteries. eBooks are not forever. We find cave drawings from ancient times, and we can decipher their meanings. But how will future historians decipher the bits and bytes that are not calibrated for whatever communications tools they have in the year 6852? Licensing can end all that. There are some unquestionable advantages to eBooks. I am quite sure they are the way of the future. But there are also some disadvantages. As with most things, progress is measured by two-steps-forward and one-step-back. 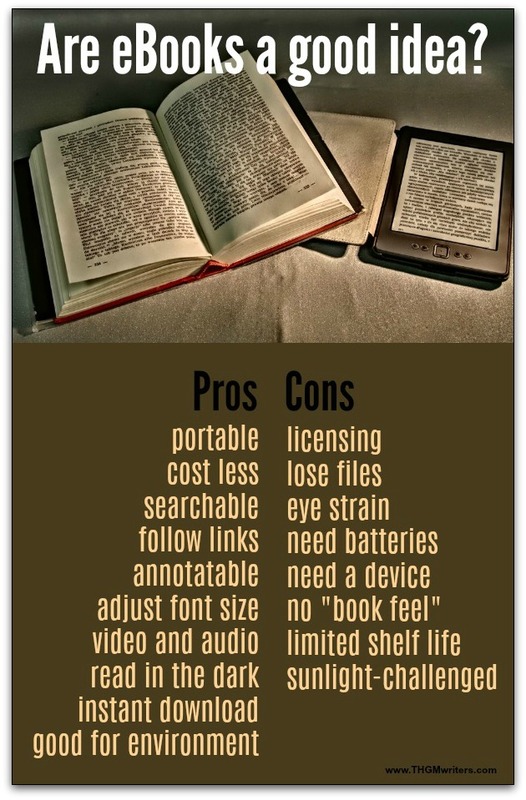 Can you think of any more pros and cons of eBooks? Feel free to add them in the comments below. Well the best thing I liked about ebooks is they are portable and we can carry 1000s of ebooks either in kindle or mobile while traveling, the same thing is not possible for physical books. I totally love ebooks and have a growing collection. From the writer’s point of view, ebooks opened a new world full of endless possibilities. You can sell your books over and over with no printing costs, without having to deal with greedy editors and publishers. This article seems to completely ignore the existing of e-ink readers. Can be read in bright light.